In addition to their unparalleled elegance, water elements add a whole new level to the property's ecosystem and overall value. Watson Supply experts provide the vast knowledge necessary for both safely constructing and maintaining a healthy pond, waterfall, or fountain, taking into account proper drainage, high-quality equipment, and dignified design choices. 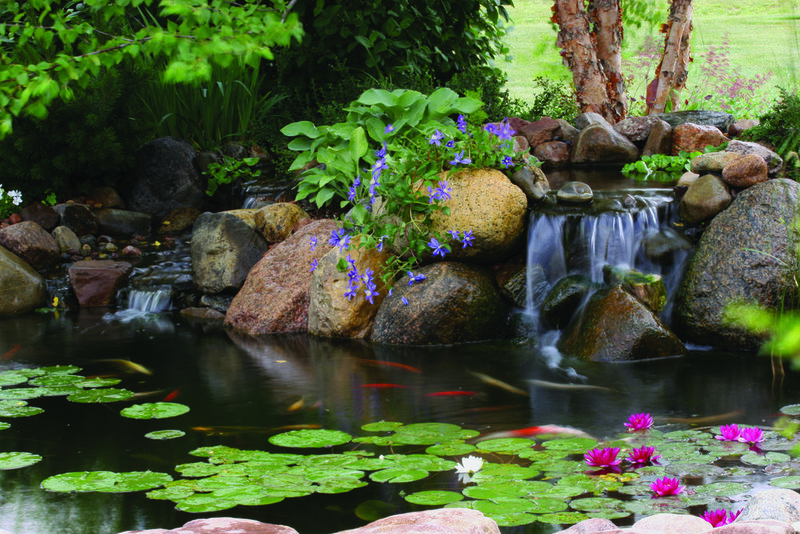 A proper balance of aeration, filtration, and durable pumps maintain the long life a healthy pond, adding inimitable beauty and peace to an outdoor retreat. The limitless varieties of fountainsapes offer a unique sense of calm and elegance, whether weaving through a garden or standing on its own in the midst of a structured hardscape. Whether self-circulating or leading to a natural pond, waterfalls provide necessary flow and aeration to an outdoor water element. Varieties include pondless options for more flexibility and safety assurance. Light your water feature for a relaxing evening. Do you have a question about water features? Our FAQ's can help! + Do I have to have fish in my pond? Fish are part of the recipe for a naturally balanced, aquatic ecosystem. A pond without fish is kind of like baking bread without the yeast. It just doesn’t work nearly as well. Not only that, but once you get used to watching them glide gracefully around your pond and you realize how little work is involved in fish keeping you, like most people, will get past the apprehension and be glad that you have fish in your pond. For more information on the natural ecosystem method of water gardening, check out our natural ecosystem section. + What is an Aquascape CAC? CAC stands for Certified Aquascape Contractor. Aquascape is the only pond manufacturer that has a certification program, which places a heavy emphasis on training, customer service and education. There are about 250 CAC’s across the country who believe in the “Pond’s done right; customers served right” philosophy. + Do I have to remove the pump from my pond for winter? In our area, you will need to make a decision if you are going to continue to operate the waterfall or shut it down for the winter. Operating the waterfall during the winter will reward you with the beautiful ice formations around the falls and stream beds, but you also have to consider that there will be a little maintenance required during this time of year, such as adding water due to evaporation and making sure ice dams don’t form in the stream and waterfalls, which could cause water loss over the edge of the stream. Due to winter maintenance required, many pond owners in cold climates simply choose to turn off the waterfalls during the winter. If you choose to turn off the waterfall you will need to remove the pump from the filter and store it in a frost-free location, such as a garage or basement. Consult the pump’s owners manual for more information on properly storing your pump. + How many plants should I have in my pond? The recommendation is to have a minimum of 40 to 50 percent of the surface area of your pond covered with plants. This can be accomplished with shallow bog plants, water lilies, floating plants, or any combination thereof. This plant cover helps shade the water, keeping it cool for the fish and slowing the growth of algae. In addition, the coverage of plants provides the fish with a safe place to hide from predators. Additionally, plants make it possible to blend your pond in with existing landscaping. + What is a Pondless® Waterfall?